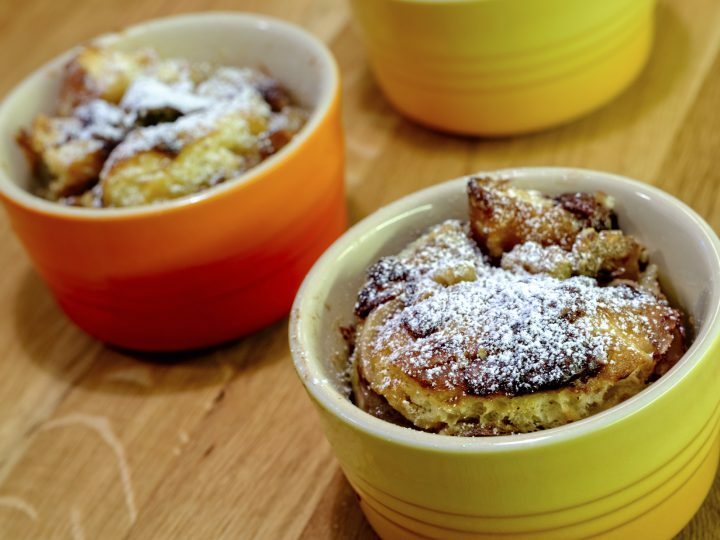 Always a firm favourite, these puddings are individual, which means everyone gets the crispy bits! The raisin bread gives a lovely flavour. Preheat oven to 170C/325F/gas 3. Butter 4 small ovenproof dishes, about 300ml/½pt each. Spread the raisin bread slices with butter and cut each slice into 4 pieces. Divide half the bread pieces between the dishes, sprinkle with the raisins and lemon rind and top with the remaining pieces. Beat the eggs with the cream, milk, sugar and brandy. Pour over the bread in each dish and leave to stand for 30mins. Bake for about 35mins, until set and the crust is golden.